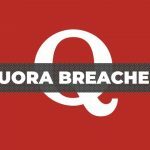 Hey !, I found this information for you: "Quora Hacked: Hackers Gain Access to Internal Database Servers". Here is the website link: https://sensorstechforum.com/quora-hacked-access-internal-database-servers/. Thank you.